In this segment, Droning America heads to Portland, Oregon in the USA's Pacific Northwest, the quirky city which lies a three hour drive south of the larger city of Seattle. Hostess Angie Avestruz met up with Seth and Brit Morrisey of Morrisey Productions to see the best of Portland and the surrounding area from their DJI Inspire and Phantom 4 Pro drones. From Mount Hood to the rocky coastline, Oregon's diverse landscapes has never looked better thanks to drones. Description: Hello from Oregon! This is one of the most scenic Droning America episodes yet. 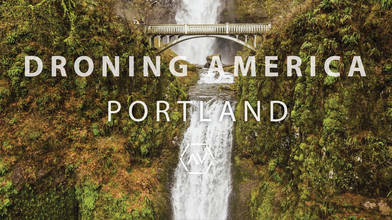 We met up with Seth and Brit Morrisey of Morrisey Productions to see the best of Portland and the surrounding area. From Mount Hood to the Western Coast, Oregon's diverse landscapes has never looked better thanks to our drones. airvuz.com/user/Droning-America VIDEO TRANSCRIPT: Angie:	Hello everyone and welcome to Droning America. I'm your host, Angie Avestruz. Today we're in the Pacific Northwest in a state known for its diverse landscapes and, we're hanging out in the city of roses. Welcome to Portland, Oregon. [00:00:30] Let's start things off in the city that likes to keep things weird by meeting up with our two special guests near the waterfront. We are so excited to be joined by Seth and Brett Morrisey of Morrisey Productions. They're hanging out with us here in Portland to show us all around. Guys, thank you so much. Brett:	Thanks for having us. Seth:	Thanks for having us. Yeah. Angie:	Tell us a little bit about your production company and how you got your start in the droning business. Seth:	So we've been doing video for action for about 10 years. We really like specializing in taking the drone to the very limit, as far as we can go. We've [00:01:00] been doing backpacking for a very long time. We figured out that drone was the new craze and that really helps us get the shot for what we're looking for. Brett:	So, we've been doing drone flights for about three or four years now. We were one of the first companies in Portland to get FAA certified and since then it's just really taken off. Angie:	Portland's really grown over the last few years in popularity both as a tourist destination and a place for people to come live. What in your guy's opinion really has put it on the map? Seth:	Well I think it's a really young city, there's a lot of recreation, there's a lot of breweries, a lot of coffee houses and just [00:01:30] a lot of things to do. Angie:	Portland's also known as the bridge town. Right now we're hanging out along the Willamette river. Talk about some of these cool bridges and their architecture. Brett:	So, the bridge right behind us is the Tilikum Crossing. It's a foot bridge as well as a max line and, buses can go across it and it was just built and it's a beautiful bridge so we like to fly drone around here. Angie:	There [00:02:00] are no shortage of beautiful places in the state of Oregon to drone. Where are some of your favorite places? Seth:	So you really can't beat it here. I mean we have all these bridges that are just insanely scenic and then, when you head east, we have Multnomah Falls and several different other falls that are really good for shooting drone. Some of our favorite places to go. Angie:	Yeah, you guys have mentioned, Portland's kind of just a stopping place for people. Brett:	Yeah, Portland's just kind of a jump off point for all kinds of recreation all the way to the Oregon coast, up and down the Oregon coast and in the east to Multnomah and then over to the desert and Eastern Oregon so, there's a lot out here. Angie:	Well, should [00:02:30] we get out of the city and check some of that out? Seth:	Yeah. Let's get out of here. Brett:	Let's do it. Angie:	We're following the Morrisey brothers lead and taking a scenic drive on the historic Columbia River Highway, 30 minutes east. Guys, we left the city and we are now at what has to be one of the coolest locations I've been to for Droning America. Where did you bring us? Seth:	Yeah so, here we are, 40 miles east of Portland, at Multnomah Falls and this place is [00:03:00] really cool because it's the tallest waterfall in all of Oregon and not only that, it's 434th of the tallest waterfall in the world so ... Angie:	Well, looking around there are a lot of people here taking photo's. This must be a pretty popular tourist destination? Brett:	Yeah. It gets over two million people a year and this is literally the Mecca for recreation. It is absolutely insane. Angie:	Wow and, it's part of the Columbia River Gorge, which you told me if you kind of look that way we can see more of the gorge. Brett:	Yeah, the gorge is a stretch that stretches all the way to the Pacific ocean. Angie:	[00:03:30] There's so much to see and explore here in Oregon. What are some of the other things around this area? Brett:	Well there's so many hiking trails right around here. There's also a lot of different waterfalls beside just Multnomah Falls and we're also just a short drive from Mount Hood so there's so much to do right around this area. Angie:	Mount Hood's definitely something people want to see if they come here and you guys have some cool footage of that? Seth:	Yeah, we love filming up at Mount Hood especially when there's snow on the ground. There's a lot of good lakes around there that are just beautiful. Angie:	[00:04:00] On the drive over here we saw some other smaller waterfalls. What are some other ones in the area to check out? Brett:	So, if you want to get away from the really big tourist spot like Multnomah Falls you can go to Horse Tail Falls, which is just right down the road, really easy to get to. If you want to get more adventurous you go to Oneonta Falls but you have to actually trek through water to get to but that's a pretty awesome spot. Angie:	Cool. Now it's time to head back in the opposite direction [00:04:30] toward the famed Oregon coast where people visit the beach, not to catch some rays but rather, for the breathtaking views. Seth, Brett, we're in your neck of the woods. Where we hanging out now? Seth:	Yeah, so here we are at Haystack Rock located in Cannon Beach, Oregon about 80 miles west of Portland. Angie:	Wow so, not too far from the city and I got to say, I've seen this rock in your [00:05:00] guys videos and I had no idea how massive it is. What's the story behind it? Brett:	So originally this is a lava flow from the Blue Mountains and the Columbia River Basin and what always surprised me about this rock is it's actually fifteen million years old. Angie:	Oh wow. Some people are watching like, think this rock looks a little familiar, why is that? Seth:	Yeah, this place is really famous. It's basically been in a ton of movies one of the major films it was featured in was The Goonies. Angie:	Oh, awesome. Well let's work our way up the coast a little bit. What else is there to see and do along this shoreline? Brett:	Yeah so of course we live around here so we love Cannon Beach. [00:05:30] We've got shore sands just right off the road about 10 miles but one of our favorite places called the Pacific City, it's a beautiful location. We also like the Samuel Boardman State Scenic Corridor which is around the bay, the southern coast. Angie:	Oh, awesome. Seth:	The great thing about the Oregon coast is all 363 miles is open to the public so you can explore the entire thing. Angie:	We've been driving around a little bit, we went to a state park over there, Ecola, is that right? Brett:	Yeah, Ecola State Park is another great place to visit. Angie:	If [00:06:00] people watching right now want to check out more of your guy's work, where should they go? Seth:	They can always use our website at morrisey dot com or, just look us up on Google, Morrisey Video Production. Angie:	Absolutely. Well guys, thank you so much. Thank you, thank you for showing us around not only Portland but the outer city as well. I gotta say, if you have a drone, this is a place you want to check out just maybe not this time of year. Seth:	Yeah, definitely come here in the summer. Angie:	To end our trip, we took a little hike up the Ecola State Park [00:06:30] at the Tillamook Head for one last view of the ocean before heading back to the city. Thanks for joining us in Portland and really all over Oregon. From [inaudible 00:06:40] to the Coast, this place is made for those who love exploring the outdoors. Hope to see you next time on, Droning America. Bye-bye.